Highland Council estimates that there were over 660,000 visitors to the Isle of Skye in 2017, on an island where there are only 10,000 permanent residents. Airbnb has over 500 listings across the island – where there are only 5000 homes on Skye. Stark figures at the heart of the highlands massive over tourism crisis that’s about to get far worse. Liam McGuckin reports. Skye, do they have the stones to deal with the problem? In the previous five years, this Hebridean Island has received a rise in visitors incomparable with any other destination in Scotland. The rapid acceleration of tourism peaked this March as CNN, broadcasting to over 200 countries, warned of overcrowding in Venice, Barcelona and the Isle of Skye. Boasting some of the UK’s most pristine landscapes, there is little preventing a rise in tourism. 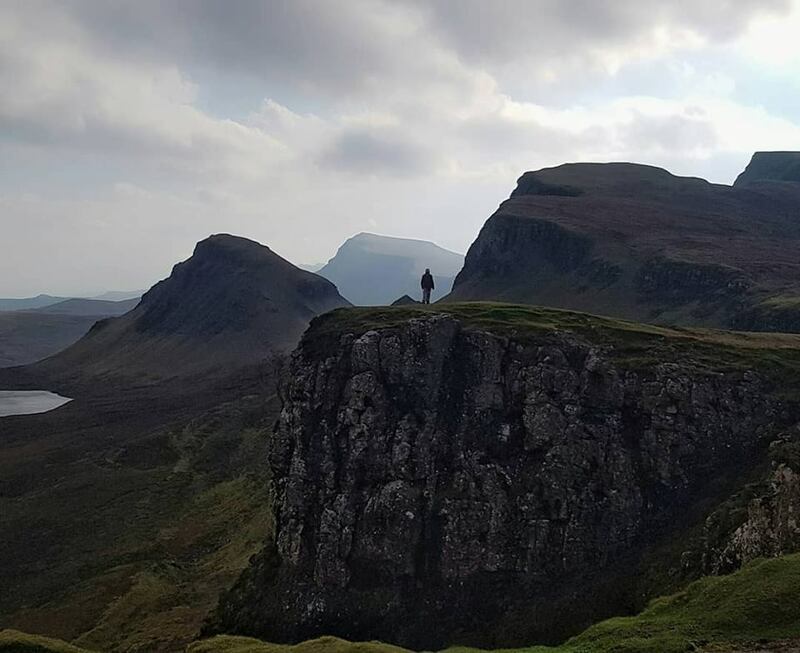 Forced to contend with a global reputation, all eyes are on Skye, as locals desperately seek a solution to the issues exacerbated by the increase in visitor numbers. Social media has influenced the recent trend, ensuring tourism seeps into every corner of the island. The incessant and pervasive ability to share information has distorted Skye’s image, pushing it to a level of popularity beyond its capacity. Inversely, the problem of social media has also been a part of the solution. Facebook groups and online forums have provided space for locals to vent their frustrations. Permitting the island’s residents to share their grievances, name and shame poor practices, and even occasionally work collectively to find resolution. Stacked onto the growing list of concerns are standing stone piles, which have become a grinding source of annoyance. Cairns, as they are locally known, are interlocking stones places one on top of another. Historically built to indicate a landmark, a trial, or even a burial site, their purpose today appears to be as multifaceted. There are locations on Skye where up to fifty of these standing stone piles are erected. It has caused strife amongst the locals and some tourist operators who attribute it to the speeding up of erosion, and as potentially dangerous to children and livestock. The perpetrators of these seemingly benign standing stone structures are almost exclusively tourists. Unaware of the historical implications of erecting the Cairns, they appear to materialise for any number of idle, ill-conceived reason. The flippancy of such practice has divided opinion, online. So, the craft of placing stones, one on top of another, is part of a much more complicated picture. #nofilter. The issue silhouettes a far more significant problem for the Isle of Skye. To an outsider, it represents a community’s struggle for control, signifying a point to channel the island’s growing resentment at the mismanagement of a runway tourism train. The standing stone issue does not stack up. Those convinced of the environmental erosion, and its subsequent deterioration, are at best, fanciful. The Fairy Glen, a popular location for the Cairns, is subject to thousands of visitors each week traipsing over the earth, and the innumerable vehicles that decimate the roadside verges. Each form of erosion is as severe, if not more, than the repositioning of stones in the area. The call to prohibit the practice echoes the recent attempt to ban plastic straws. On the one hand, the straw embodies the systemic frivolity of choice and the flagrant malpractice of a society consumed by plastic: on the other, to stop their production is only the very tip of the whole problem. Single-use plastic is a 21st-century quagmire that requires unified action. To stand, self-indignant, sipping from a glass is to rest your laurels at the top of a much greater battle, while actively ignoring the totality of the situation. I do not support the decision to erect standing stone piles for pseudo aesthetical reasons, or for most other, but I do not think it deserves the same platform on today’s environmental stage. Prof. Jane Downes, director of the Archaeological Institute of the Highlands and Islands, observed the current jeopardy of approximately half of the 3000 archaeologist sites on Orkney due to climate change accelerated by human activity (1). Higher levels of rain and rising sea levels are already affecting a number of sites across the island. The residents of Skye might soon be thankful for the standing stone piles – they may be the only places for tourists to stand soon enough! If it were seriously an argument pitched on environmental uncertainty, then I would ask, where is the opposition for the reopening of a commercial runway on Skye? The last commercial flight to the island was back in 1998. Proposals to redevelop the airfield would require an investment of over £2 million. The service, to operate from Skye to both Glasgow and Edinburgh, could transport as many as 15,000 visitors a year (2). Given what we already know about the CO2 emissions, the development of a commercial airline is a direct juxtaposition to the Paris Climate Agreement. It is easy then to view the standing stone fiasco on Skye as representative of the current model of tourism. The bottom rock denotes the island’s infrastructure, above it, the accommodation, the facilities, the work-opportunities, the environment, and then the community itself – sat precariously on top. Moreover, when you characterise like this, it is not difficult to identify that the locals are poised on an improbable structure – where balance is everything. Future proposals for ongoing problems are numerous, and there are many calling for a tourist tax to be implemented. And this is often the case; whenever an issue reoccurs many will turn blindly and reach for the neoliberal yardstick to take measure of the solution. It ignores the larger picture: that there are no straight lines on the island, and the volume of visitors to Skye is just not sustainable. The brazen attempt to throw money at the issue falls short of finding a pragmatic solution to the myriad of compounding problems associated with mass tourism. The Highland Council estimated that there were over 660,000 visitors to the Isle of Skye in 2017(3) – on an island where there are only 10,000 permanent residents. Airbnb has over 500 listings across the island – where there are only 5000 homes on Skye. With landlords turning to short-term leases, for short-term profits, local MSP, Katie Forbes, reiterates the reality of rural poverty and homelessness in the Hebridean Islands. 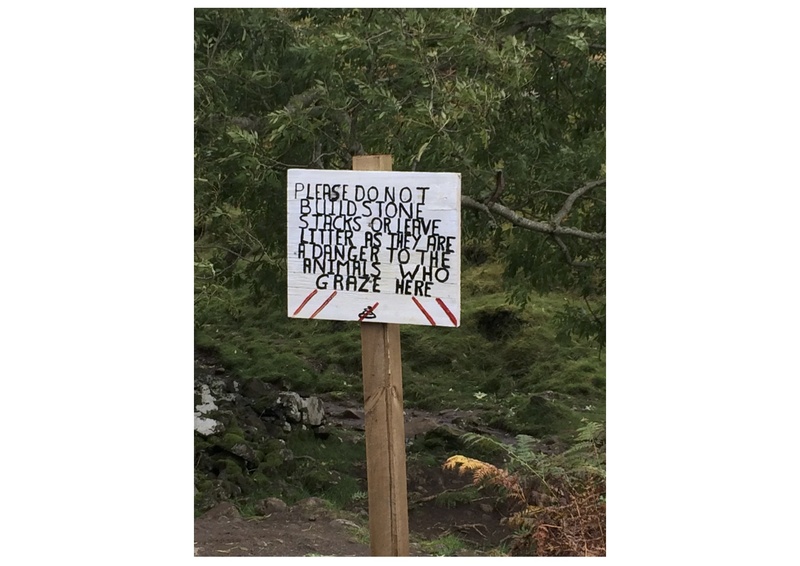 This model of tourism, uncharted and untested, is having an adverse effect on Skye. It threatens its very existence. When communities are repeatedly hollowed out, replaced with transient travellers, the very reason for coming there becomes an inverted idea. Culture and tradition lose all meaning, and over time are reduced to the superfluous, as gimmicky tat. The very essence of a place, plundered by wave after wave of tourism, is eventually washed away, eroded by a mindless sea. And, just like the standing stones, their story folds over time until it finally becomes arbitrary and meaningless. Autumn storms roll in, and uncertainty clouds residents here on the Isle of Skye. Where equilibrium and balance are everything, there is desperate need to realign priorities before another busier season ensues. The issue would be far less severe were rural public transport improved. That’s where future efforts should be focused. As the author points out, it is car traffic (and parking) that is doing the environmental damage, not people per se. The number of private vehicles allowed on to the island at any one time could and should be limited and shuttle buses/local taxis/hire should take over. Same goes for other islands e.g. limiting tourist vehicles would free up much needed space for locals on the Arran and Bute ferries and restore traditionally car-free places like Cumbrae to their formerly idyllic selves. I’ve seen far greater numbers of people descending on rural/semi-rural locations elsewhere in Europe with far fewer effects, mostly down to better train and bus networks. Maybe it’s even time to restore the tram network on Bute (ask your gran). Indeed! The Highlands and Islands Development Board took a strategic view of the transport needs of rural communities and tourists way back in the 1970s. The valuable initiatives it took in that area were dismantled when the Tories came to power and imposed their neoliberal ideology on public transport provision. In situations like this, I would turn to the standard text on driving visitors away from tourist destinations, and ask What Would Scooby Doo? Clearly the cairns are an opportunity, so I suggest a robot monster clad in local stones which at rest resembles a badly-constructed pile, that lumbers into a menacing biped shape when tourists approach (and lighting conditions are poor enough to confuse shaky attempts at mobile cameraship). With any luck, visitors will be put off without needing to resort to fake crushed-tourist installations. Just, you know, don’t leave any clues; ban camper vans; and watch out for pesky kids. Skye, like most of rural Scotland has pretty rubbish infrastructure which affects everyone who lives there. Apart from the trunk road and the new road to Sleat. It makes getting children to school, going to the shops, getting about for work take twice as long as needs be, public transport services take longer and are less efficient and less used as a result. Intercity bus, rail to Kyle and Mallaig all take forever. Living there is hard work. Build infrastructure for the people who live there, build homes, build diverse businesses. Stop supporting and subsidising tourism businesses. I couldn’t agree more – especially about building homes. And these need to be kept for people who want to live and work in Skye all year round, so there would have to be restrictions on their use ( no short term rentals) and their sale ( not on the open market). The same applies to other areas eg Argyll, Edinburgh. I couldn’t agree more. Especially what you say about homes for people who want to live and work in Skye all year round. It looks as if the time has come for restrictions on use ( no short term lets) and sale ( not on the open market). The government wouldn’t even need to build the homes for locals. Just let local people have a serviced building plot for, say £5k, to cover fees and services and let them get on with building their own homes. A low interest govt. loan could be provided over 10 – 20yrs to help pay for the plot. Many of the folk living and working on Skye are “newcomers”; adventurous, resourceful go-ahead people with tenacity. They would be well able to make a home for themselves if given land to build on. The more “indigenous” locals have a long history of helping to build each others’ houses. People just need to have the free use of their own land. visited Skye in late September for the first time in decades. was shocked and embarrassed to be Scottish. was assured that every bed in the island was booked. prices were a rip off. Cannot understand why tourists want to visit the place since there was “nothing being staged to encourage them”. suggest a) strict inspection and licensing system for hotels and b & bs; b) a complete halt on any public cash going into promoting the island`s tourism; c) increased effort made by the tourists board to publicise other more worthy parts of Scotland. I grew up in Devon and in the 80’s there were already what I would describe as ‘fake’ villages, like Salcombe. These we where tourism has removed locals to such an extent that in Winter there are literally no lights on and shops such as the bakers shut until the spring. Salcombe had been a fishing village until the 50/60’s arrived and it was adopted by the London yachting fraternity and ‘celebrities’. Now average house prices are 667k with a waterfront house over £2 million. They like many ‘charming’ and ‘quaint’ coastal villages in Devon and Cornwall operate park and ride schemes to manage the huge numbers of visitors. It’s not a great thing….unmanaged tourism. The locals resent the grockles even though they know their economy depends upon them. It’s really a symptom of our huge inequality isn’t it? One group with money to burn, and another group earning a poor crust by servicing the former’s frivolous leisure time. Tourism is the economic driver for the Skye Economy, it provides a direct livelihood for around 3000 people, with a positive knock on effect for many other sectors, probably most notable the building and construction industry. You are correct that Skye received in the region of 660,000 visitors this year (a reduction on the previous 2 years) , the English Lake District will have received between 18 and 20 million. The Isle of Skye is 1/3 larger than Malta which has a population just approaching half a million and with a diverse economy that includes agriculture, manufacturing, a service industry and tourism. The issue is not simple, visitor behaviour has changed significantly in recent years, while visitor numbers to Skye increased by around 14% between 2014 and 2016, visitor numbers to the “Fairy Pools” increased by 54%, other locations witnessed reduced visitor numbers. A combination of Social media, international films and new visitor demographies has driven attention to probably 5 key “pinch points” on Skye all on single track roads which comprise 66% of the island’s road network. Away from these locations the picture is significantly different to the one that you portray. Air BnB can be painted as a saviour or sinner, the collaborative economy platform has provided opportunities for both existing businesses and those with accommodation but in low paid jobs to increase their annual income. The flip side is that it has taken accommodation away from the local market, the solution is not to ban or get rid of the system but a) to look at sensible regulation that recognises the needs of the local community, visitors and business, several other countries have managed this successfully., and b) to build more affordable accommodation, the two are not mutually exclusive. There are many businesses and community organisations working hard on Skye to make it a great place to live and visit, could I invite you to help with this work. Alistair, I would agree with some of the points that you outline. Including the blithe suggestion of Air BnB as either hero or villain, as it merits a more nuanced approach than that. It is, of course, a vital secondary income for some of the families on the island. Moreover, I champion your call for sensible regulations at this pivotal stage. I just hope that the article was clear in that tourism is not implicitly the problem, providing it is equitable and well managed. Rather, in this the epoch of sustained growth there is a need for space to actively reflect, and frame future development on the Isle of Skye. I worry though that in the depth of your quantitive points that perhaps you’re overlooking something more fragile than the infrastructure. The community. Unless regulations are agreed then set, the reality of destinations like Skye to be hollowed by corrosive tourism is palpable. I see that you didn’t mention it, however, the proposal for the redevelopment of the runway is equally disparaging. Pitched at a time of environmental uncertainty, how is there limits to assure this isn’t a service hijacked by rich tourists? Anyway, thank you for the response. I would, of course, take you up on the offer. Liam – hi, I would agree that the community is potentially fragile + wrote an article on that very subject for the Skye & Lochalsh Echo a few months back. You are right that we should not focus on the numbers game however identifying certain quantities does have a value in trying to piece together what is happening when there is such a strong change in visitor behaviour over such a short period of time. May the debate continue! I think this quote from Roberta Brandes Gratz, award-winning journalist and urban critic, is relevant: “…if you do it for the local, the visitor will come. If you do it for the visitor, the local will lose its character…” and the visitors, i.e. tourists, won’t return. I would agree, my best holidays have been where there are obviously vibrant local communities.